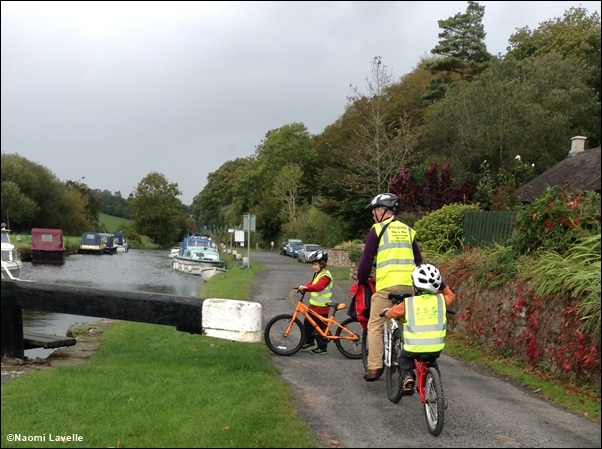 The second half of our Carlow Walking Festival experience involved a family cycle along the tow paths of the river Barrow. Despite the activities of the previous day we were up and out of bed early in anticipation of the day ahead. 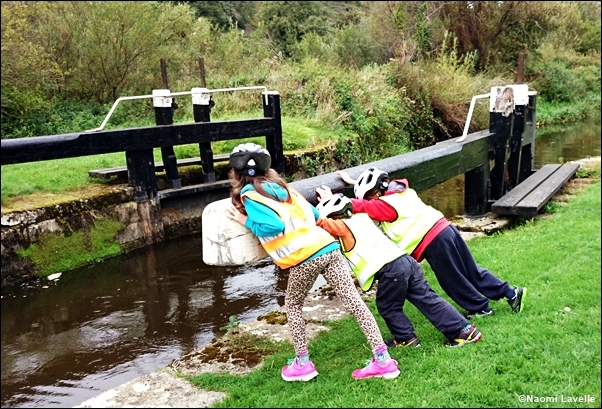 We collected the bikes from the Waterside Bike & Hike in Graiguenamanagh. A family run business, we found Brian and his wife extremely friendly and helpful, making sure that the bikes were correctly adjusted for each of us before we headed off. 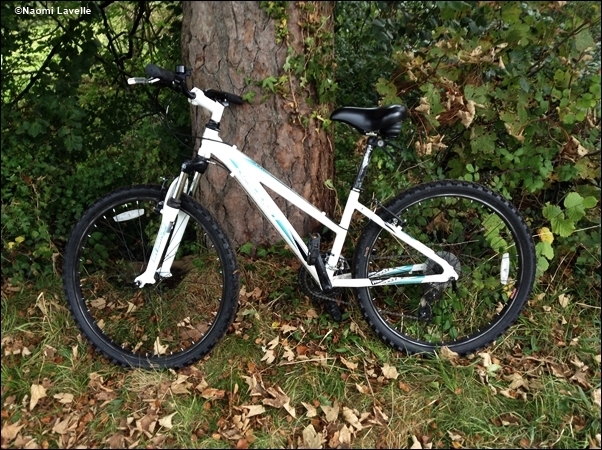 They have a good range of good quality bikes for all ages including tow along bikes for adult and child and child seats. They also provide all helmets, hi viz vest and any other equipment required, ideal for the tourist or traveller who doesn’t want to be bringing all those things with them. From the moment we set off I could tell it was going to be a good day, the scenery was stunning for the entire journey. The children were delighted with the freedom to cycle under their own steam and the adults were pleased with the safety element…. no traffic to worry about, so we could let the kids off. Every corner we turned seemed to fill our eyes with yet another glorious scene. There is always something special about being surrounded by water, trees and nature… this path had them all in abundance. The adult-child tandem bike was perfect for our youngest, he got to cycle when he wanted, or just sit back and enjoy the ride. My husband tells me you could really feel the benefit when he did pedal, but it didn’t happen all that often! 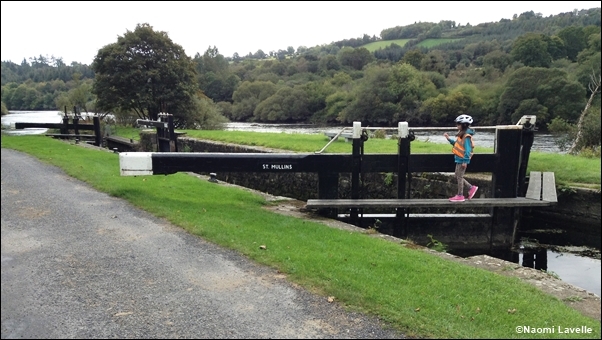 Just a few minutes into our journey we came across our first lock and we all jumped off our bikes to explore. To the children’s delight a barge came along just as we did, so they got to help work the gates. As well as being a great novelty for the kids it was a wonderful way for them to really understand how the system works. It was a pity to see part of the trail lined with Himalayan balsam. This non native species is a vigorously invasive plant that has spread from cultivated gardens into our natural landscapes. The plant, in its native environment is used to arid and difficult conditions and has adapted to such a harsh habitat by producing thousands of seeds, in the hope that a small few will prosper. Unfortunately, in the Irish climate all the seeds have a high success rate and the plant spreads rapidly. We showed the children how the plant disperses its seeds, the seed pods become dry and taught until they pop under the slightest pressure, flinging the seeds into the air. We thought it was so cool we even took a video, although I think Sir David Attenborough may have made a slightly better version. We were delighted to spot a red squirrel along the path, it was on the other side of the river but we watched it travel through the trees for quite some time before it disappeared from view. The red squirrel is a native species but its population and distribution are on the decline since the grey squirrel was introduced. The grey squirrel is larger and has taken over much of the red squirrels habitat so seeing one on our cycle was a real delight. The red squirrel is more active than its grey cousin, needing to consume about 5% of its body weight in food every day to maintain its high metabolism. The presence of the red squirrel showed the local woodland was obviously healthy and well maintained as it supported the red squirrel’s diet and there was obviously no invasion from the grey squirrel in the area. 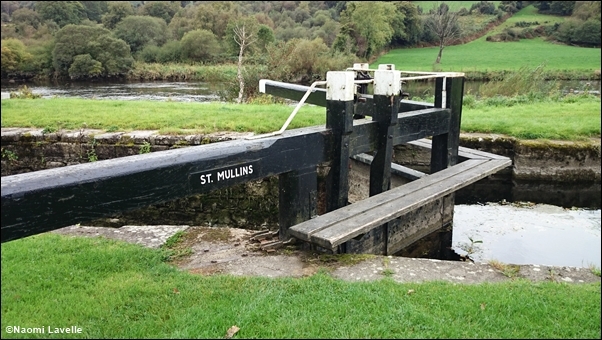 Brian had told us that once we reached the fourth lock we were nearly at the Mullichin cafe where a welcome respite was on offer. 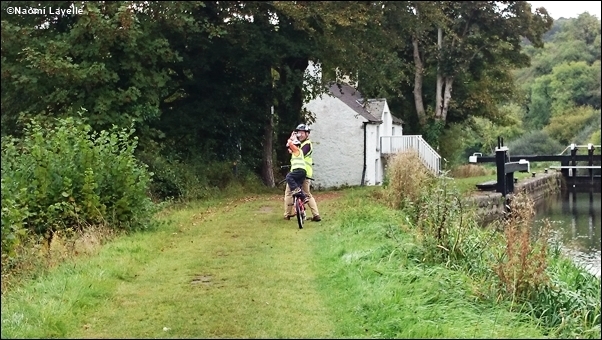 I have to admit we all speeded up once we reached the lock, the thoughts of some well deserved cakes were a great incentive. 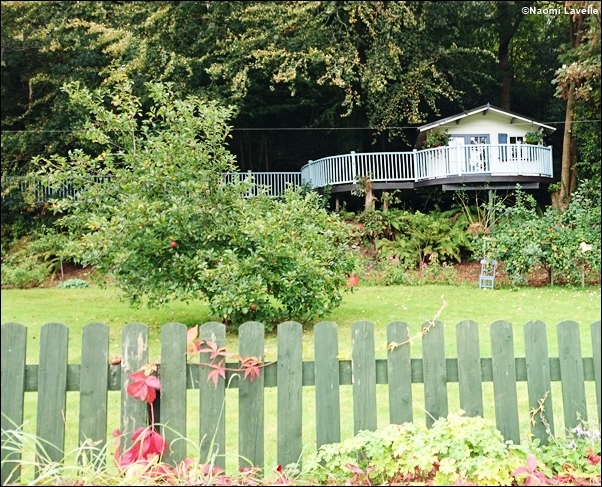 The Mullichin cafe is located about four miles down the green road and is a real oasis in an already fertile spot. 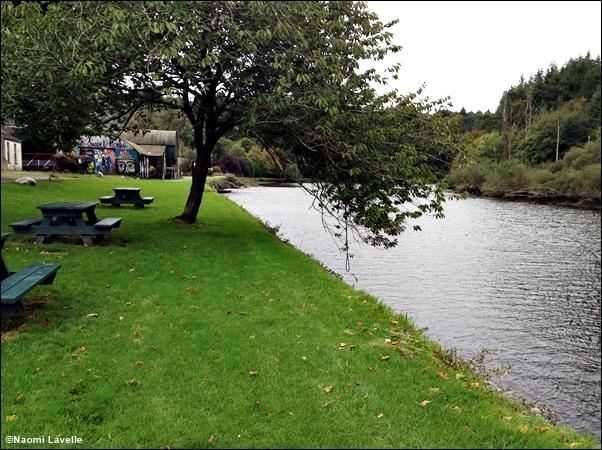 Situated beside the river Barrow it has plenty of space outdoors to enjoy both the beautiful food and scenery. Even in October there were people enjoying the outdoor seating, I imagine this is a thriving spot in the Summer months. Once again there was a sign to detail the flora and fauna to be found in the area. The children pointed out everything they had seen. We were told the food was good in the Mullichin and it definitely didn’t disappoint. The kids tucked into hot chocolates and a variety of cakes. There was even a gluten free option which I decided to have along with my cappuccino and it was delicious. The staff of the cafe were exceptionally friendly and easy going and the interior was bright and inviting. There was even a play area of small children. We had a great chat with the owners, who were on site and hands on. They took a few minutes to answer our questions and filled us in on some local lore and information. With our tummies full of the lovely baked delights we started our return journey. But there is always time for another bit of lock exploring! We loved this “tree top house” we came across along the route. The children said it looked like the best tree house ever. Even the odd shower didn’t dampen our spirits and there was plenty of trees around to provide a natural shelter. 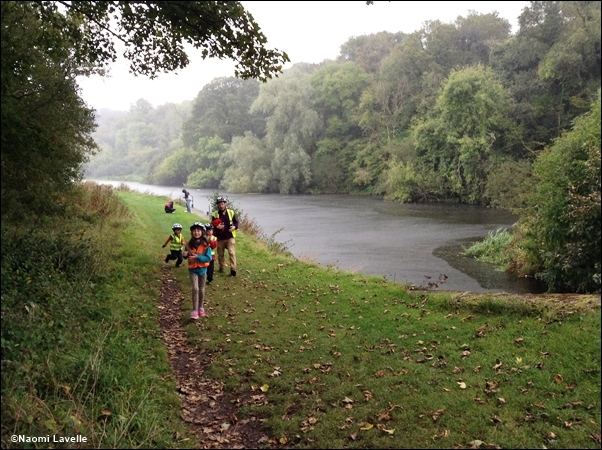 I was dry and smug while I took this photo of the rest of the family running for shelter. 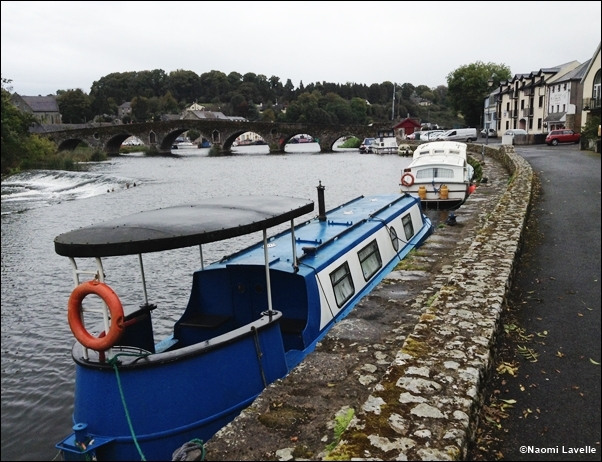 I was really taken by the beautiful bridge in Graiguenamanagh and loved this view as we rounded the corner at our journey’s end. Would we go back again? Most definitely! Next time we might consider an Ecology Bike Tour with Waterside Bike & Hike. Talking to Brian before we set off we could tell he was an expert on the local flora and fauna, it would be great to tap into all that knowledge on one of the guided tours as he knows just where to stop to spot such elusive locals as otters or a kingfisher. Travelling to any new area is always enriched when you get to know more about the local history too. 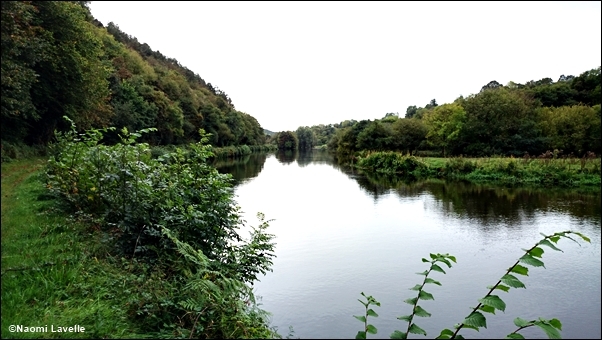 The tow path of the Barrow river also stretches upriver as far as the grand canal in Co. Kildare so there is so much more to explore. The safety element was a big plus for me, with so many traffic free miles of path on offer. 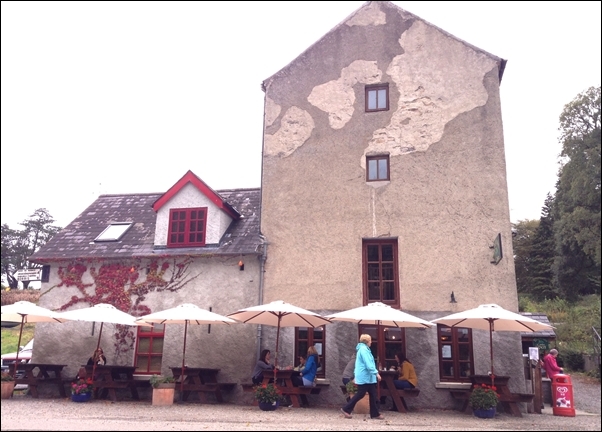 You really couldn’t pick a more picturesque area for a cycle and once again we were struck by the friendly and helpful nature of Brian and his wife at the Waterside and all the staff at the Mullichain cafe. You may go for the scenery, the food and the outdoor activities but you will stay for the banter, the craic and the genuine friendliness of the people you meet there. There were plenty of other activities over the festival weekend, not least of all… plenty of walking, as the name suggests. 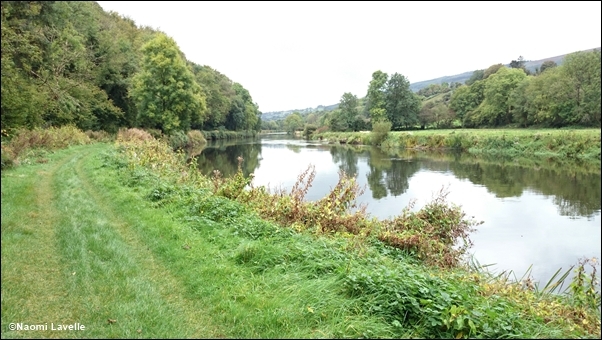 If you want to check out what else was on and what other people though you can read Dee Sewell’s review of the walks she attended over on her Greenside Up blog. Una Halpin of Wildways Adventures lead a walk and also took her son on another, she wrote about both here. It is a lovely place, definitely worth a visit. The tow paths are a perfect way to get away from it all. 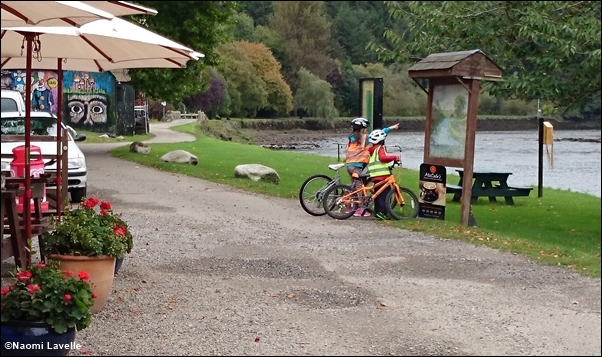 We’ve walked and cycled them, including the trip to St Mullins, though unfortunately the cafe was closed on the Monday – we should have checked opening times! It looks like Waterside Bike Hire have really taken the time to think about everything in terms of singles and families. Great to read your review and certainly an article to share when suggesting places to visit in Carlow and Kilkenny. This looks wonderful and not too far from me!